The delightful summer weather is almost upon us once again, which means we are going to be spending a significant amount of time outdoors. It also means that one of the most pressing issues facing Australia is also going to be at the forefront of a lot of people’s minds: skin cancer. Not only do an estimated two out of every three Australians get skin cancer by the time they hit age 70, but skin cancers like melanoma also account for roughly 80% of all newly diagnosed cancers every year. All told, more than 2,000 people die every year from skin cancer — in fact, 2,162 people died in 2015 alone. Here’s an infographic that shows how skin cancer has been affecting millions of lives. 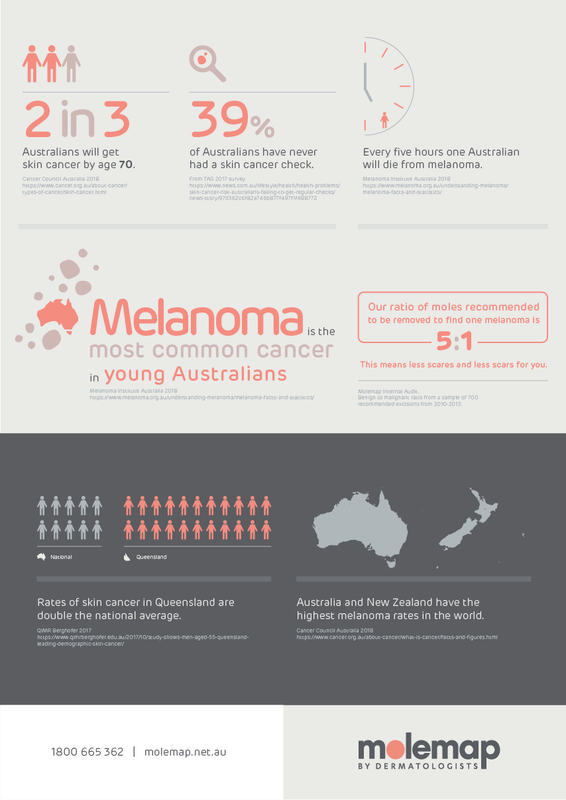 These statistics paint a vivid picture of just how common skin cancer and melanoma, in particular, are among Australians. Australia’s rate of skin cancer is high; in fact, now we’re only being outpaced by New Zealand — and not by much. Ultimately, this comes down to three crucial factors: our skin type, our lifestyle, and our location. Any one of these three factors, on their own, would be bad. Taken together, they’re the reason skin cancer is a concern in the country. Many of the people living in Australia are descendants of colonists from British and other areas in Europe; meaning, we have fair skin. And we’re living in an environment where our skin is not properly adapted for. People with lighter skin tones produce less melanin than darker skin tones, which is the way that our body naturally protects us from UV radiation. Thanks to the fact that we get well over 200 days of sunshine per year on average, many Australians are very active outdoors. Things like water sports, spending an afternoon in the park, BBQs at home, and other activities all increase our sun exposure, which significantly increases our risk of skin cancer. Australia is located very close to an area called the Antarctic ozone hole, which is a spot that experiences a dramatic thinning of the ozone layer every spring. During that time, higher volumes of harmful UV rays are able to come through the atmosphere, causing a significant amount of harm to people with unprotected skin as a result. This is also why the UV index is so high every spring. Who Is at High Risk for Skin Cancer? As mentioned above, one reason skin cancers like melanoma are common in Australia is because of our lifestyle. We tend to spend a lot more time outdoors and in the sun than people from other countries, thanks to our warm climate and our love of swimming, surfing, and other fun outdoor activities. National Skin Cancer Action Week is a weeklong event aimed at raising awareness of skin cancer prevalence in Australia and highlighting the importance of prevention and detection. A Cancer Council Australia initiative, one of the core purposes of the National Skin Cancer Action Week is to remind Australians to take action with their skin health and the importance of early detection of skin cancer. Detecting and removing skin cancer early is the key. It’s almost always curable. One of the things they highlight is Aussie teenagers’ views on tanning. In their research, they found that 62% of teenagers think tanning is a good thing. This means our teenagers have not fully grasped the negative effects of tanning. Whilst many Australians think there’s such thing as a ‘healthy tan’, the reality is that it’s a proof that you’ve been exposed to a high-enough dosage of UV radiation to damage your skin. Not only will this cause things like sun spots, sagging skin, and wrinkles, it also increases your skin cancer risk significantly. This year, the National Skin Cancer Action Week invites young adults and those who are fond of tanning to #OwnYourTone. Remember, it’s better to be pale and still be enjoying life. Remember to take the common preventive measures to avoid getting too much sun (e.g. use an SPF30 suncreen, wear a broad-brimmed hat, stay in the shade, etc.). Most importantly, it’s always best to check your skin regularly for any changes. With two in three Australians diagnosed with skin cancer by age 70, we need to take skin cancer detection seriously, and this is especially true if you’re high risk. Detection is every bit as critical as prevention when it comes to skin cancer. If precautionary measures are not taken, the odds are likely that you or a loved one would face this ordeal. That’s not something you can necessarily control. What you do have a say in, however, is what happens next. Since 2005, we have been a trusted provider of advanced melanoma detection and surveillance services in Australia. Using the world’s most thorough and trusted skin cancer detection program, our registered nurse melanographers provide Spot Checks, Skin Checks, and Full Body Molemaps. Our team of highly trained and independent dermatologists, who work remotely, are experts at diagnosing early stage melanoma. If you’d like to find out more about why skin cancer is so common among Australians, or if you want to take action and get a skin check book your check up today.